Spicy potato patties served with mint-corriander chutney is an all time favorite of mine. Easy to make, this vegetarian, gluten free, vegan, snack is popular with kids and adults. It can be paired with bread to make a very filling sandwich. 1. Combine all the ingredients in a bowl. 2. Divide the mixture into 10 to 12 lemon size balls. Shape each ball into a flat, dish shape. 3. Lightly oil a fry pan. 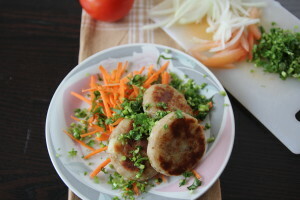 Shallow fry each cutlet (tikki) on medium flame till golden brown on both sides. 4. Serve with Mint, corriander dip.